Though the Mona Campbell Building is newer and greener than the rest of Dal’s buildings, in some ways it’s no different than the others: concrete and steel brought to life by the people who spend their days working, writing and thinking inside its walls. Now, 18 glowing cube-shaped lanterns, hung over the stairwell just above the building’s third floor, are capturing that life and sharing it through colour and movement. 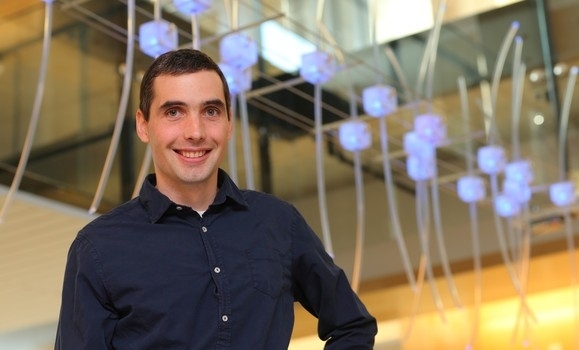 The art installation is called Patch, and it’s the work of Dal Computer Science PhD student Stephen Kelly. 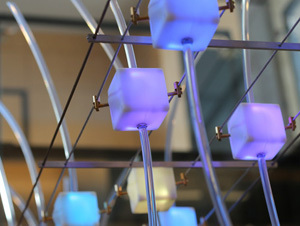 Its behaviours aren't random: the cubes move and change colour based on data from the building’s environmental systems. At the moment, their motion is based on the carbon dioxide levels in each of the building’s classrooms: the more students there are in the classrooms, the more the lanterns will rock back and forth. And as the building’s water usage spikes — pre- or post-class washroom breaks, perhaps — the cubes change from dark blue and begin to light up with yellows, purples and greens. “The [building’s] green roof was also an inspiration — the way [the lanterns] move like blades of grass,” he adds, pointing at the plastic tubes that wave as the cubes start to sway. The project has had a long gestation: Kelly has been working on it in stages over three years, and the original idea goes back even further. It began during the planning stages for the building itself, when Peter Dykhuis, director of the Dalhousie Art Gallery, and Rochelle Owen, director of sustainability, identified an opportunity through the Canada Council for the Arts’ New Media Residency Grant to create a unique piece for what was to become the university’s greenest building. Kelly was chosen for his unique combination of proven artistic talent — he was longlisted for the Sobey Art Award last year — and programming expertise. He worked with staff from the Office of Sustainability and Facilities Management to tap into the building’s data systems and make them talk with the installation. He also noted how appropriate it was to have a NSCAD University grad like Kelly bring an original, innovative art piece to the Mona Campbell Building. Kelly, a full-time PhD student, expects to be on campus for at least a couple more years, during which time he will continue updating and building upon Patch. For example, he plans on incorporating other colours that will reflect changes in energy use or steam released by the building. “I’m always interested in creating art that has a life of its own, that has an aesthetic or behaviour that reaches beyond my control,” he says. Dykhuis and Kelly thanked the many individuals and groups who helped guide the project. They came from all corners of the university and beyond, demonstrating just how interdisciplinary the project was: Facilities Management, Dal Engineering, Dal Architecture, Dal Libraries, the College of Sustainability, the Office of Sustainability, Johnson Controls, the building's architect (George Cotaras), NSCAD and many more. “I just hope that it generates some stimulating conversations about the building,” says Kelly.